A site for comic collectors who are interested in international (domestic and foreign) Star Wars comics. Star Wars had a Halloween themed comic, Star Wars Halloween Special, published in October 2009 which I already highlighted in an earlier blog. It was a decent enough story, but it was not the only horror themed Star Wars comic. Star Wars: The Dark Times is a series published by Dark Horse that launched out of Star Wars: Republic. It follows the exploits of the human Jedi Master Dass Jennir, the Nosaurian Separatist Bomo Greenbark, and the crew of the smuggling ship, the Uhumele, during the era following Order 66. The title of the series is taken from Obi-Wan Kenobi's speech to Luke Skywalker from the original movie: "For over a thousand generations, the Jedi Knights were the guardians of peace and justice in the Old Republic. Before the dark times... before the Empire." The series lived up to it's title as our heroes encounter one grim event after another. The first arc in Star Wars: The Dark Times is called The Path to Nowhere and is told in the first five issues of the title. The first issue starts with an Imperial attack on the planet New Plympto. Bomo's wife, Mesa, and daughter, Resa, are evacuated along with other Nosaurians on a ground transport to a nearby spaceport in the hopes of reaching Sullust. Bomo and other Nosaurians led by Jennir stay behind to hold off the Imperial forces and buy time for the evacuees. The Imperials eventually rout the Nosaurians and Bomo and Jennir retreat to the spaceport. There, they meet up with the crew of the Uhumele and learn Bobo's wife, daughter, and other Nosaurians were captured by the Imperials who planned on selling them to slavers. In the second issue, Jennir and Bomo help the crew of the Uhumele escape the spaceport on New Plympto which the Imperials have on lockdown. In the third issue, the Uhumele reach the planet Orvax IV where the slavers have taken the Nosaurian slaves. Bomo learns that his wife Mesa was killed trying to prevent the slavers from taking Resa. In the fourth issue, Jennir, using decidedly un-Jedi like techniques, learns who Resa was sold to and where she was taken. For as dark as this story has been up to this point, writer and editor Randy Stradley (using the psuedonyms Mick Harrison and Welles Hartley) went even darker in Star Wars: The Dark Times #5. In this final issue of the first arc we see Dass Jennir, Bomo Greenbark, and the crew of the Uhumele confront the buyer, Dezono Qua, on his home world Esseles. Qua is a human noble who has purchased other young species from the slavers in the past. In a gut-wrenching moment, we learn that Dezono Qua buys the younglings for food and Resa had already been killed, cooked, and eaten by Qua. Upon hearing this, Jennir guns down Qua which sets up an ongoing conflict between Jennir and Bomo, who felt it was he who should have taken care of Qua. This was a powerful ending to the first arc in the Star Wars: The Dark Times title. Instead of a happy ending to the first story, the repulsive action by Dezona Qua is one of the most horrific events ever encountered in a Star Wars story. Dark times indeed. 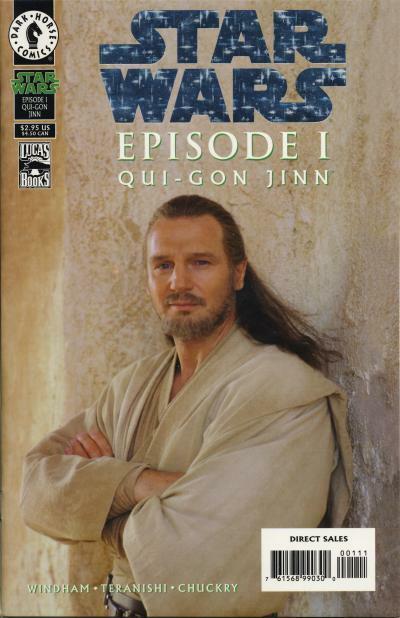 The fourth and final one-shot that is part of the Star Wars Episode I: The Phantom Menace Adventures comics is Star Wars Episode I: The Phantom Menace - Qui-Gon Jinn. 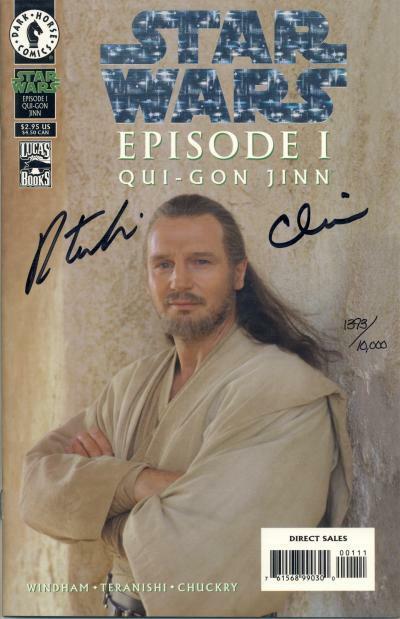 The Qui-Gon Jinn one-shot was released in July 1999 with two covers, a photo cover and an art cover. The Dynamic Forces holo-foil cover is the same as the photo cover (including the $2.95 price), except the large Star Wars logo contains a holo-foil overlay. It comes with a certificate saying it is limited to 12,500 copies and originally retailed for $10. Each certificate is individually numbered. 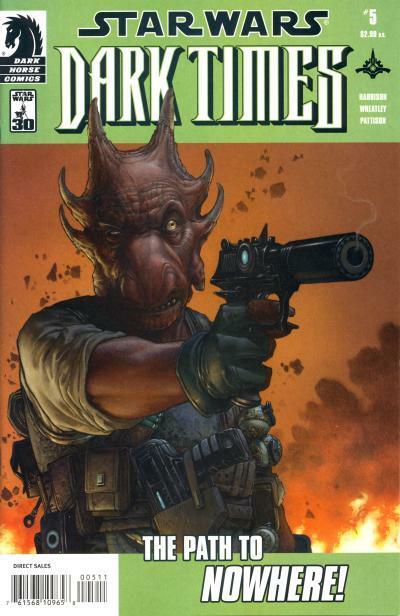 Dynamic Forces also released a signed edition of this comic in 1999. This signed edition was limited to 10,000 copies and originally retailed for $29.95. Each certificate is individually numbered and matches the number on the cover. The third one-shot that is part of the Star Wars Episode I: The Phantom Menace Adventures comics is Star Wars Episode I: The Phantom Menace - Queen Amidala. The Queen Amidala one-shot was released in July 1999 with two covers, a photo cover and an art cover. The Dynamic Forces holo-foil cover is the same as the photo cover (including the $2.95 price), except the large Star Wars logo contains a holo-foil overlay. It comes with a certificate saying it is limited to 12,500 copies and originally retailed for $10. Each certificate is individually numbered. Dynamic Forces also released a signed edition of this comic in 1999. This signed edition was limited to 10,000 copies and originally retailed for $19.95. Each certificate is individually numbered and matches the number on the cover. Bleeding Cool has reported that Star Wars: Vader Down has already sold over 450,000 copies. Unfortunately, with the way the article is written, it is hard to tell if this is 450,000 copies for Star Wars: Vader Down #1 or 450,000 copies for the entire event. I am guessing, based on the number of variants for Star Wars: Vader Down #1 that are showing up, the sales are for just that issue alone. If this is true, this comic will be the second best selling Star Wars issue behind Star Wars #1 since Marvel reacquired the license. Since Marvel does not have an adaptation for The Force Awakens planned for release with the movie (rumors are we will see an adaptation early next year), presumably because Disney is wanting to control what leaks out about the movie, Vader Down is going to have to serve as the surrogate. Please read the article titled Star Wars: Vader Down Sells Over 450,000 - From MCM London Comic Con. The second one-shot that is part of the Star Wars Episode I: The Phantom Menace Adventures comics is Star Wars Episode I: The Phantom Menace - Obi-Wan Kenobi. 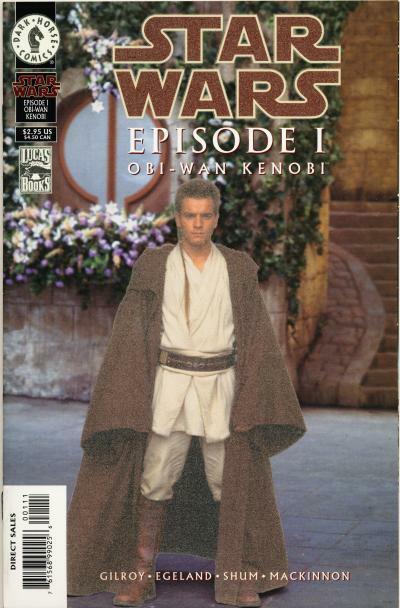 The Obi-Wan Kenobi one-shot was released in June 1999 with two covers, a photo cover and an art cover. The Dynamic Forces glow-in-the-dark cover is the same as the photo cover (including the $2.95 price), except the cover glows in the dark. It comes with a certificate saying it is limited to 15,000 copies and originally retailed for $10. Each certificate is individually numbered. 1999 was a big year for Star Wars fans and especially for Star Wars comic collectors. After a 16 year gap, the first new Star Wars movie, The Phantom Menace, was released to movie theaters in May. The previous year, Dark Horse Comics was part of the Lucasfilm marketing plans when in December 1998, they released Star Wars #1 starring a new Jedi Master from The Phantom Menace, Ki-Adi-Mundu. This ongoing title would be joined by The Phantom Menace trade paperback in April and the 4-issue adaptation in May as well as several related titles starting with Star Wars Episode I: The Phantom Menace - Anakin Skywalker. The Anakin Skywalker one-shot proceeded one-shots for Obi-Wan Kenobi, Queen Amidala, and Qui-Gon Jinn and they would be collectively known as the Star Wars Episode I: The Phantom Menace Adventures comics. In addition to the release of The Phantom Menace, 1999 would be the year that Dark Horse would start publishing Star Wars comic exclusives for Dynamic Forces. Dynamic Forces is a company that specializes in variant and signed comics. They had been doing this with comics and trade paperbacks for Marvel, DC, and Image Comics as well as other publishers. This year, they published variant, signed, and sketch covers for several of the first issues of Marvel Star Wars titles. 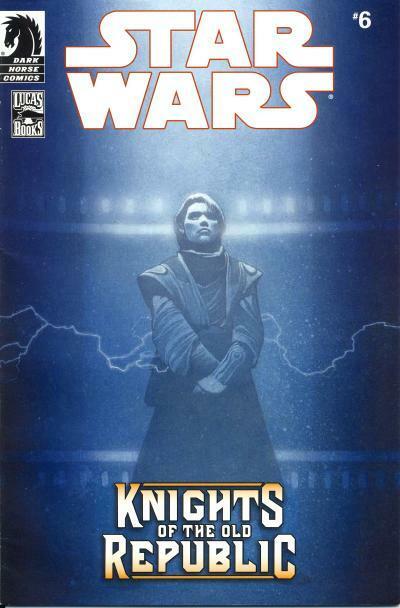 Dark Horse had published Buffy the Vampire Slayer comics for Dynamic Forces earlier, but the first Star Wars comic was the Star Wars: Vader's Quest gold foil cover on March 3, 1999. A Vader's Quest gold foil cover signed by David Prowse was released on June 2nd. Dark Horse would publish many Star Wars comics for Dynamic Forces over the next few years, mostly for #1 and other special issues. 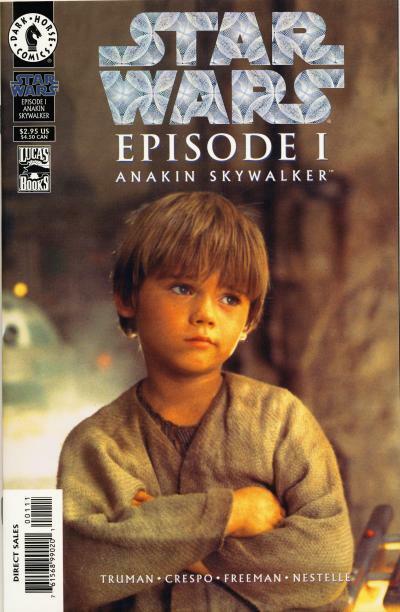 The Anakin Skywalker one-shot was released in May 1999 with two covers, a photo cover and an art cover. The Dynamic Forces holo-foil cover is the same as the photo cover (including the $2.95 price), except the large Star Wars logo contains a holo-foil overlay. It comes with a certificate saying it is limited to 15,000 copies and originally retailed for $10. Each certificate is individually numbered. 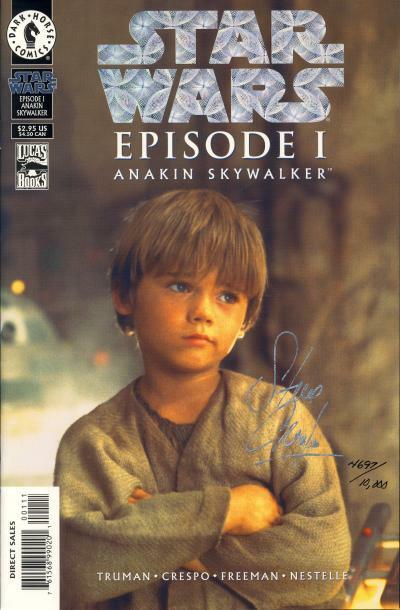 When Star Wars Episode I: The Phantom Menace - Anakin Skywalker was released, it sold approximately 69,000 copies to retailers and was ranked as the 17th best selling comic for the month (The 4 issues of The Phantom Menace 4-issue adaptation would rank higher the same month.) The Dynamic Force issues are additional copies not included in those numbers. Besides the holo-foil cover, there is also a gold foil cover for this comic. Many of these Dynamic Forces variants took many months, if not years, to sell out. Demand for the Dynamic Forces Star Wars exclusives have increased in the past year on eBay. Prior to this, it was common to find this comic priced around $3 - 5. Because of the large print run for these The Phantom Menace variants compared to modern variants, they have not increased in price as high as some of the other Dynamic Force Star Wars variants. This particular variant can still be found on eBay for less than the original retail price of $10. Since earlier this year, I have been gathering information about the many Dynamic Forces exclusives for Dark Horse's Star Wars titles per a suggest from a poster on the CGC Forums. Dynamic Forces did release several new covers in addition to enhanced covers. There are also more signed copies that do not have a new or enhanced covers. Personally, I treat the new and enhanced covers as variants and seek them out for my collection. I have plans to publish blogs in the future showcasing those comics. 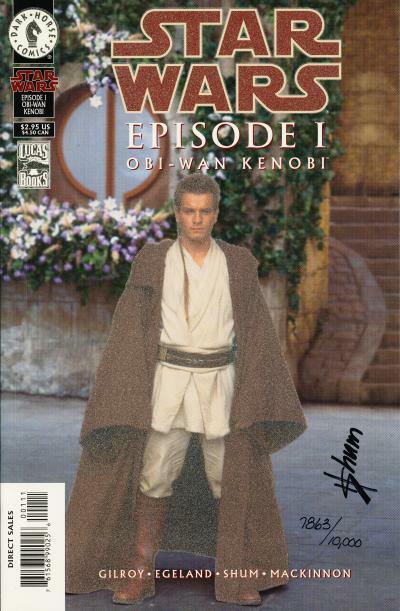 As for the signed covers, even though they come with certificates, I do not feel they are any different than the many signed Star Wars comics with certificates from other retailers or dealers. I am not seeking those out and will only show them when it accompanies a variant cover. 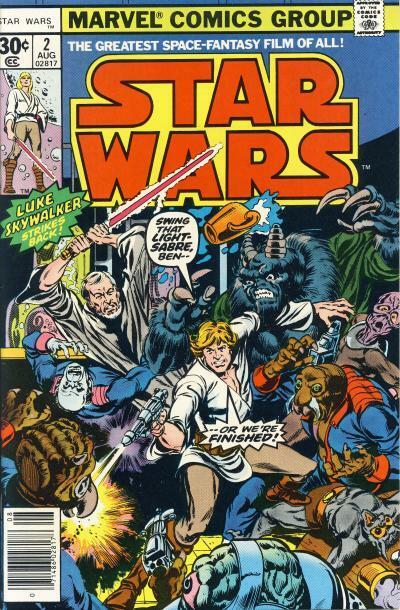 Archie Goodwin wrote 37 of the Marvel Comics Star Wars issues starting with Star Wars #11. He also wrote the Star Wars strip in Pizzazz #7 - 16 as well as several original Star Wars stories in the British Star Wars Weekly. In addition, he took over writing from Russ Manning on the Star Wars daily strip that ran in newspapers in a story titled Planet of Kadril on August 11, 1980. After the Planet of Kadril story, Goodwin adapted Han Solo at Stars' End for the comic strip. Writer Archie Goodwin first collaborated with artist Al Williamson on Star Wars with Marvel Comics The Empire Strikes Back adaptation. Williamson joined Goodwin on the comic strip on February 9, 1981 in a story titled The Bounty Hunter of Ord Mantell after the completion of the Han Solo at Stars' End adaptation. 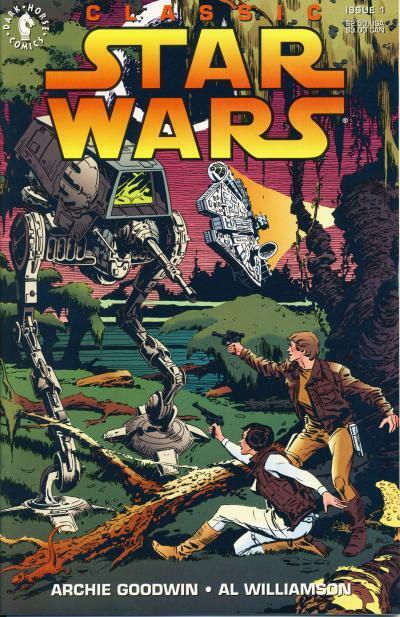 It is Goodwin's collaboration with Williamson until the comic strip's end in 1984 that many consider the classic Star Wars comic strip run. Archie Goodwin and Al Williamson would also work together on Star Wars #50 and the Return of the Jedi adaptation for Marvel Comics during their tenure on the strip. In 1991, Russ Cochran Publishing released a 3 book hardcover set that collects the Goodwin and Williamson Star Wars comic strips in their original black and white format. One year later, Dark Horse would reformat and color these strips and release them in a comic book titled Classic Star Wars which ran for 20 issues. 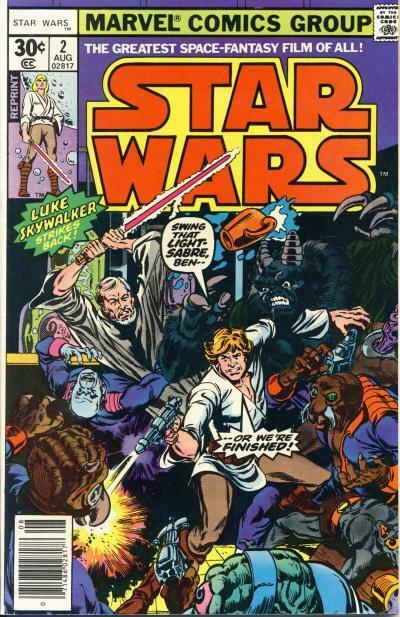 Classic Star Wars #1 contains new Al Williamson art on the cover. Williamson is a classic comic strip artist who studied under Burne Hogarth and is cited as an influence for many artist who grew up looking at his strips. The cover is very reminiscent of the rich detail that Williamson provides in the art inside. 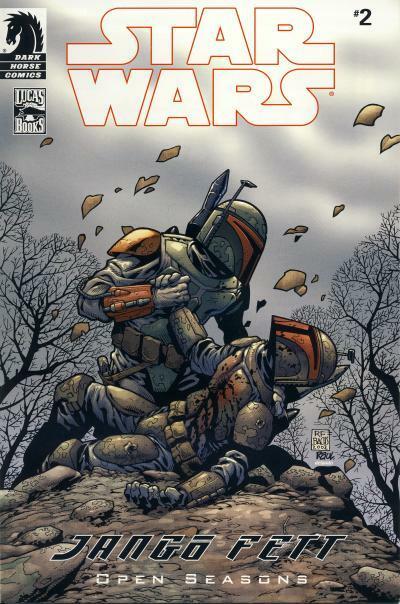 Classic Star Wars #1 is the first part of The Bounty Hunter of Ord Mantell story. The Goodwin and Williamson collaboration on the strip consists of stories that take place between Star Wars and The Empire Strikes Back. Because these stories are told after The Empire Strikes Back was released and continued past the release of the Return of the Jedi, several of the characters, vehicles, and space ships seen in these later movies are included in the strip. The end result is a story heavy on continuity that fits seamlessly between the first two movies. The Classic Star Wars title is only the second Star Wars title published by Dark Horse comics. It begins before the mini-series Star Wars: Dark Empire ends. Like Star Wars: Dark Empire, the issues in this title are very reasonably priced, many times selling for less than the cover price of $2.50 in NM condition. 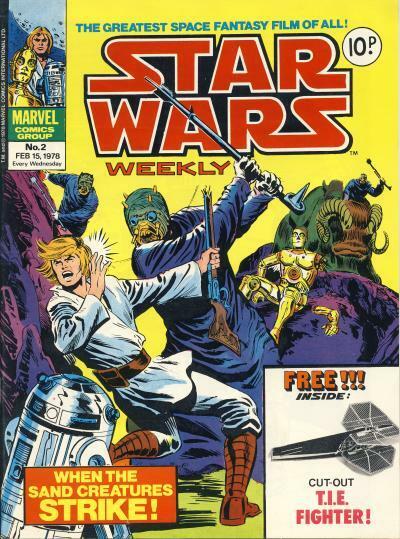 Star Wars Weekly #2 was published in the U.K. on February 15, 1978 and contains the second half of the content of the U.S. Star Wars #1. 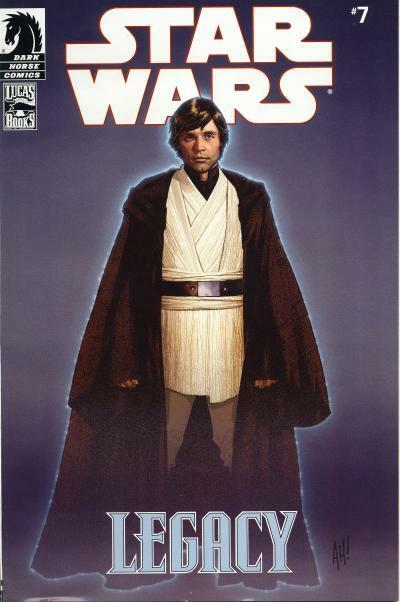 The cover is the first of many unique covers that appears on the magazine sized Star Wars Weekly title. The cover captures the attack on Luke Skywalker by the Tusken Raiders, or Sand People, on Tatooine. Like many comics of the era, the cover does not exactly depict the scene as it occurs. The cover declares FREE!!! Inside: Cut-Out T.I.E. Fighter! and includes a picture of the cut-out. 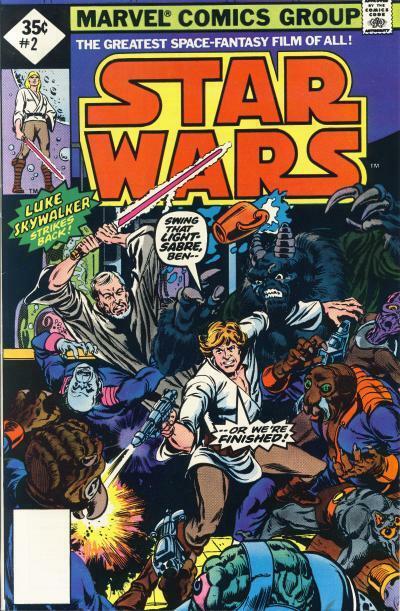 The drawing in the upper left hand corner is the same as Star Wars #1 with Luke and the two droids and adorns every cover until Star Wars Weekly #50 when it is replaced by a new image. Interestingly, these images in the upper left hand corner are strategically placed on the cover based on how comics were displayed on the newsstand so potential readers could see what the comic contained without seeing the entire cover. These images had been a staple of Marvel comic covers since 1963, but just as comics disappeared from the newsstand, these pictures in the upper left hand corner disappeared from the covers completely in the 1990s. The back cover has the same Micronauts toy ad as Star Wars #1. As promised in the previous issue, this issue contains a free enemy fighter cut-out. The TIE Fighter cut-out is on an unattached insert card and is firing a laser. If you compare it to the more intricate X-Wing Fighter cut-out, it makes sense they added the laser to give this toy more heft. As you can see, the cut-out TIE Fighter has the wings incorrectly attached to the top and bottom of the cockpit pod instead of on the sides! In 1945 Dr. Enesto Sibal started a bookstore called Centralbooks in the Philippines' capital city of Manila. His son, Jose Sibal, followed in his father's footsteps and started Alemar's. By the early 1980s, Alemar's had grown to a chain of 12 stores. 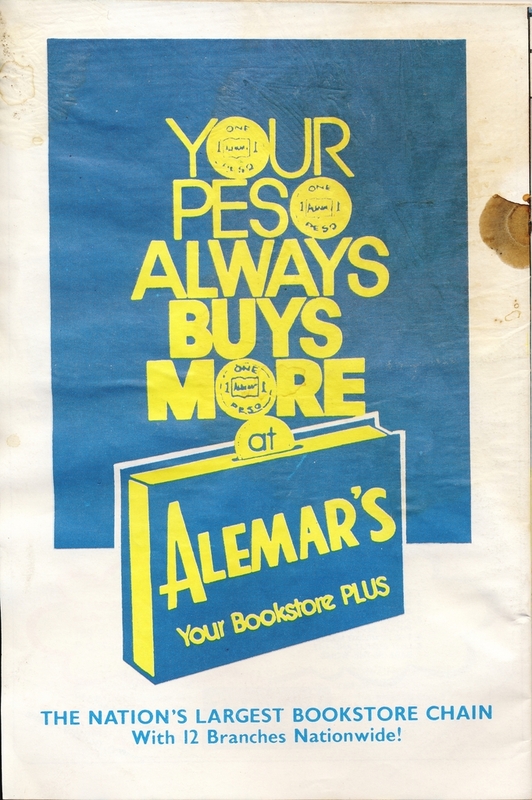 Sometime in the mid 1980s, Alemar's had closed. Bookstore chains in the Philippines published and distributed local editions of U.S. comic books. There are comic books published by Alemar's, National Bookstore, and Goodwill. Philippine editions of U.S. comics are considered some of the rarest foreign comics. It is speculated that because they were published and distributed by bookstore chains the print runs were not large and when you factor in the climate conditions of the Philippines, very few of these comics have survived and those that have are usually in worn condition. The Philippine edition of U.S. comics books are almost exact replicas of their U.S. counterparts, including being in English which is an official language in the Philippines. Even the indicia on the first page is taken from their U.S. counterpart. They differ from the U.S. edition by some minor modifications to the front cover and the inclusion of local ads, mostly for the bookstore chain that published the comics. 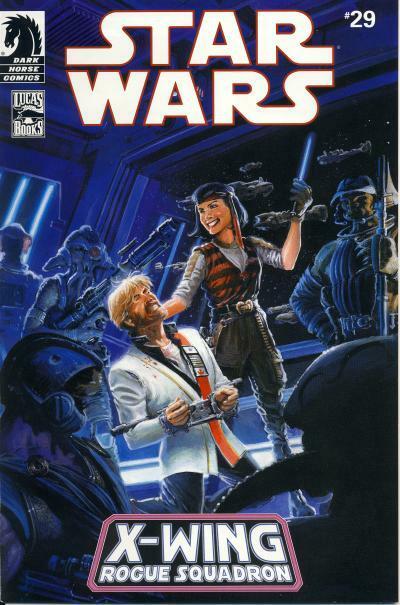 There has been speculation about a National Bookstore edition of Star Wars #1, but no pictures proving the existence of this comic have surfaced. What has been discovered are Alemar's editions of Star Wars #1 - 4. Alemar's Star Wars #1 is a well known comic book, having been discussed by comic collectors for several years now. What does not appear to be known is when exactly the comic was published. The Alemar's Star Wars #2 that found it's way into my collection may help with this. This comic has moisture damage and rusty staples which are common problems with Philippine editions. A sticker covers the UPC symbol which is blacked out. The information about the price, issue number, and month has been replaced by SW 102. Alemar's Star Wars #3 has SW 103 and Star Wars #4 has SW 104 printed in this same location so this is probably a reference to the title/volume/issue number. As for the sticker, the U.S. based restaurant chain, Shakey's Pizza, opened up in the Philippines in 1975 and today there are more Shakey's restaurants in the Philippines than in the U.S. The Shakey's Pizza sticker reads "Watch for Vol III on Nov at Shakey's". The III is hand written. Could a Shakey's Pizza store have distributed these Alemar's Star Wars comics to kids who ate there? Shakey's did give away toys, stickers, mask, etc. to kids. Could the "Watch for Vol III" be a reference to the Alemar's Star Wars #3? I researched the years that the first 3 stores opened, with the 3rd store opening in 1980. If Shakey's distributed these Star Wars comics around they time they were published, this would mean the comics were published in 1980 or later. Since we know Alemar's closed in the mid 1980s, that would place the publication of this comic between 1980 and 1985. Here is a picture of the three issues in my collection. One copy is in extremely nice condition with only a few ink marks on the cover. The second copy has the Shakey's sticker. The third copy is incomplete, missing the center page, and has extensive ink marks on the cover. Regardless of when the comic was published, the Alemar's Star Wars #2 is a cool example of a Philippine edition of a U.S. comic book. If you are like me, you have a limited budget with which to purchase comics. Many times I vacillate between just collecting vintage Star Wars comics or trying to collect modern and vintage Star Wars comics. Late last year, I actually considered giving up collecting modern comics altogether when I learned about the number of retailer variants Marvel was planning to release for Star Wars #1. I knew when the license reverted to Marvel, variants were going to be my Achille's heel; I'm a completist by nature and keeping up with the variants during the Dark Horse era was fairly easy. But to be honest, the number of variants Marvel released with those initial issues earlier this year was worst than I could have imagined! For the most part, I have a complete domestic Star Wars comic collection up to the modern Marvel run with some notable exceptions: the expensive newsstand Star Wars $0.35 issues, a handful of the Dynamic Forces Star Wars variants during the Dark Horse era, and many of the newsstand issues of the Dark Horse titles. As you can imagine, just the fact that I am pursuing newsstand copies of Dark Horse Star Wars comics tells you the psychological problem I faced with the avalanche of Marvel Star Wars variants. Instead of dropping all modern comics from my pull list, I dropped all modern comics except the Star Wars titles. This meant giving up titles like Boom's Planet of the Apes, Dynamite's Battlestar Galactica and Flash Gordon, IDW's Star Trek, and many science fiction titles published by Image Comics. Basically, I decided to go all in on just Star Wars comics for my vintage pursuits and my modern reading and collecting. I have an extensive Star Wars trade paperback collection that I love reading and re-reading. The first title I collected was the original Marvel Star Wars title and during the 1990s when I strayed from comics, I still kept purchasing Dark Horse's Star Wars titles. I knew if I gave up on modern comics entirely and did not purchase and read the modern Star Wars comics or attempt to collect what I could, I would regret it. I believe I found a happy compromise where I pursue the vintage foreign comics, pick up the occasional vintage domestic comic or Dark Horse variant, and purchase most of the modern variants. While it does bug me from time to time knowing my modern Star Wars comic collection is not complete, I also look at this as an opportunity for my collection in the future. I know that at some point I will grow tired of looking for elusive vintage foreign Star Wars comics. I will no longer want to purchase the umpteenth copy of an original Marvel Star Wars issue. At that point I imagine I will begin filling in the holes in my modern Marvel Star Wars collection. I remember when the ratio'd variants use to be priced according to the ratio: 1 of 5 variants sold for $5, 1 of 10 variants for $10, 1 of 20 variants for $20. and 1 of 50 variants for $50. While some retailers still use that pricing model, looking at eBay, a vast majority of those ratio'd variants are now priced at half of the ratio: 1 of 5 variants are still $5, commanding a slight premium over cover price, but so are 1 of 10 variants, 1 of 20 variants are $10, and 1 of 50 variants are $25. Additionally, the comic market is littered with once lofty variants that now languish in value because the collecting community has moved onto the newer, hotter comic. Logically, it makes sense that in this environment, purchasing variants at new prices is a losing proposition. Why purchase a new variant today for $20 when it will be valued at $10 a year from now? So, you can imagine, while I wish I could purchase every modern Star Wars variant as they are released, the prospect of me purchasing modern comic variants at a lower price in the future is appealing. Today, many movies produced by Hollywood studios are released to foreign markets before they are released domestically. Back in the 1970s when Star Wars was released, this was not the case. In fact, Star Wars came out 2 months earlier in the U.S. before its next premiere in the Philippines. Most Western European countries saw Star Wars released in October - December 1977. China, the second largest market for Hollywood movies today, never even saw the movie released! In fact it was shown for the first time in that country during the Shanghai Film Festival this summer. Oddly enough, the United Kingdom was one of the last European countries to get the movie when it premiered on December 27, 1977 even though principal photography occurred at Elstree Studios in London. 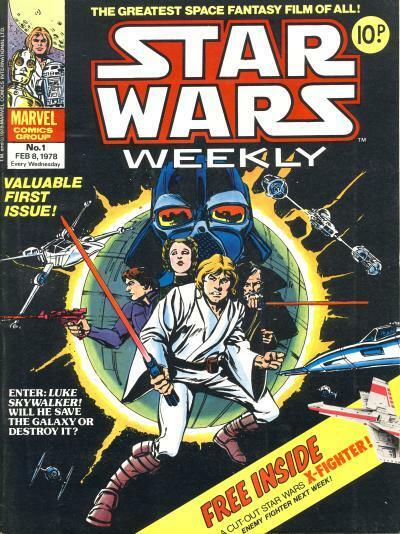 Marvel UK, the British publishing imprint of Marvel Comics, published Star Wars Weekly #1 on February 8, 1978, a little over a month after the movie debuted. The first issue contained the first half of the content of the U.S. Star Wars #1. The cover is mostly the same as the U.S. Star Wars #1 with some minor modifications. The star field is absent and the glow around the Death Star has been altered slightly. The Y-Wing Fighter in the lower right hand corner has been moved up to make way for a banner that says FREE INSIDE A Cut-Out Star Wars X-Fighter! Enemy Fighter Next Week! which also has a picture of the cut-out. The Fabulous First Issue! box has been replaced by a boxless Valuable First Issue! blurb. Gone is the blurb about the film studio and producer/director. The box around the other remaining blurb is also removed. Darth Vader and the Death Star swap colors, with Vader now bluish black and the Death Star green! Only the cut-out offer detracts from an otherwise more aesthetically pleasing cover than it's U.S. counterpart. The back cover shows toys from the popular, but short lived Micronauts toy line. This toy line was manufactured by Mego in the U.S. and by Airfix in the U.K. 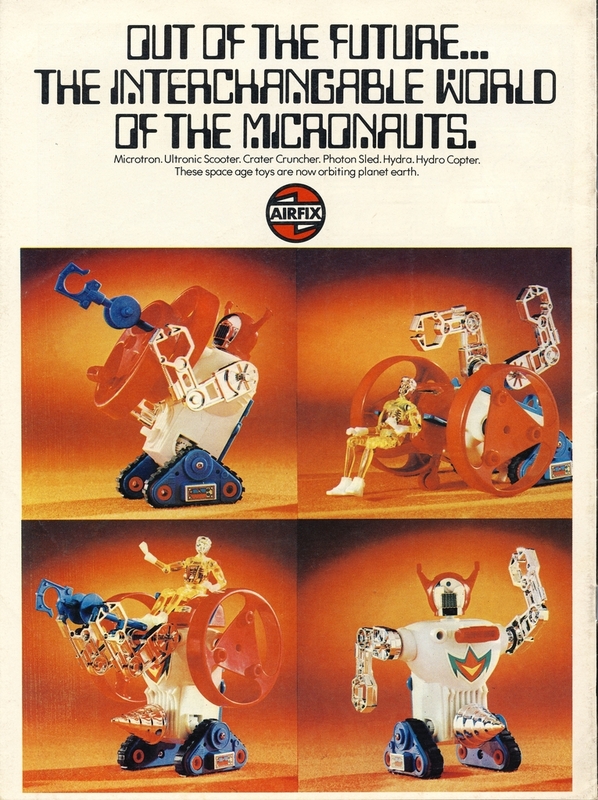 Noticeably absent in the toy ad are many of the Micronaut action figures that were released in the U.S. Apparently Airfix only released the Time Traveller and Pharoid, instead relying on the incredible vehicles for sales. The unattached free insert is wrongly named a X-Fighter on both the front cover and on the insert card. 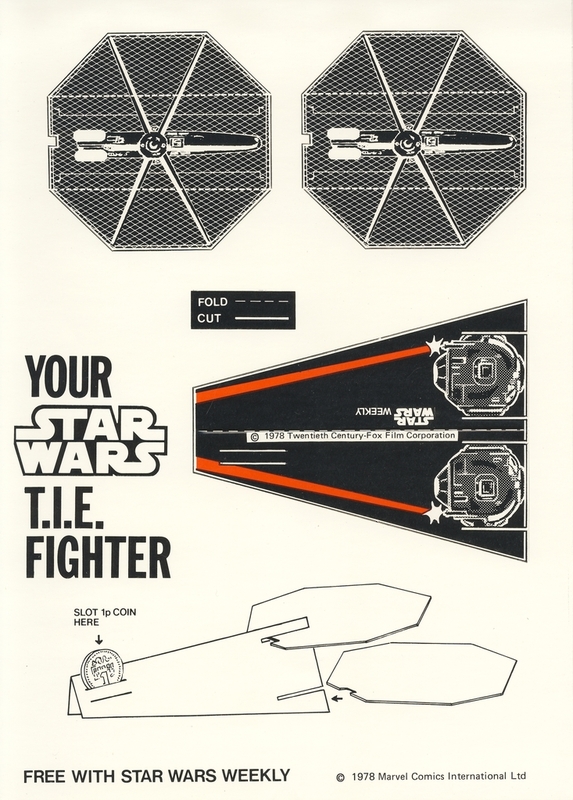 While the card shows the places to cut out the parts to build the X-Wing Fighter, no cutting is necessary as the pieces are already perforated and can be punched out easily. Star Wars Weekly #1 is not a tough comic to find, although finding an issue complete with the insert is slightly more challenging. Because of the larger size and thin nature of the weeklies finding high grade copies can be harder. In February 1997 the first Wizard 1/2 issue to contain a Star Wars story was published, Star Wars: X-Wing Rogue Squadron Wizard 1/2. 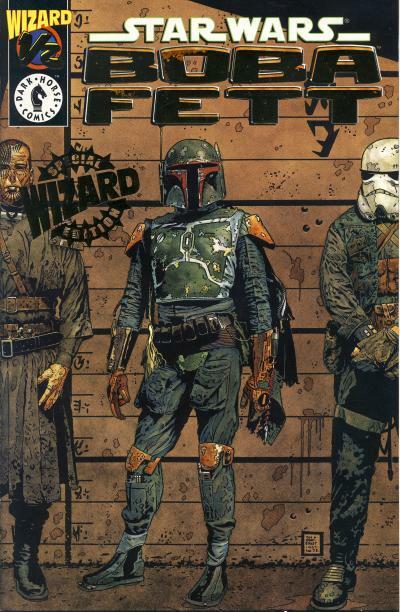 In December 1997 the second Star Wars Wizard 1/2 issue was published, Star Wars: Boba Fett Wizard 1/2. The story, titled Salvage starts with Boba Fett aboard the Slave I coming across a derelict ship. He boards the ship and forces one of his alien prisoner, Tsumo, to walk point. In the cargo hold they find a casket full of holes. They soon discovers the crew is dead and Boba Fett plans to salvage the ship. It turns out the crew was attacked by a swarm of parasitic insectoids, brought on board the ship by the body in the casket. The insectoids killed and bored into the crew's bodies and laid eggs. Tsumo and Fett are attacked by the insectoids and Tsumo dies. Fett orders Slave I to disembark and burns the insectoids from his armor igniting the ship. He uses a waste capsule to escape the burning ship which explodes. Back aboard the Slave I, we learn that while Fett lost the prisoner and the salvage, he retrieved an amulet from the casket which will more than compensate him for his troubles. 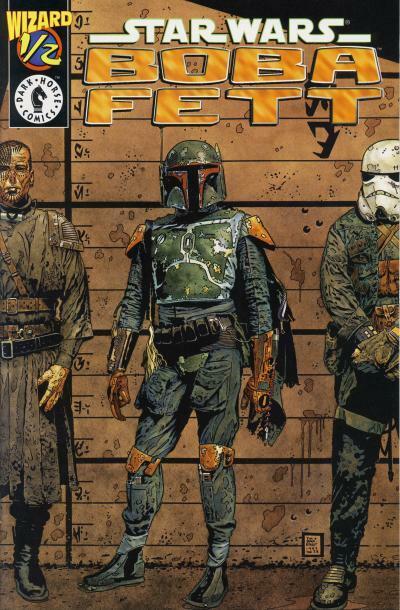 Like the other Star Wars Wizard 1/2 issues, the Boba Fett issue also has a variant edition. The gold edition is a little harder to find and commands a premium over the regular edition. The regular edition usual sells for $5 - 15 on eBay with the gold edition selling for $15 - 25. The Comics Chronicles has released the September estimated sales and the existing titles held steady while the new mini-series took the top position. Star Wars: Shattered Empire debuted to strong numbers in line with the first issue of the previous mini-series, Star Wars: Lando #1, which sold 192,949 copies in July. This issue accounts for just under 38% of the total Star Wars comics shipped in September. The other mini-series title this month, Star Wars: Lando, fell over 7,000 copies or 10.53% and the title is now selling less than 1/3rd of the first issue. It is too early to say how future Star Wars mini-series will trend with only 1 completed mini-series, Princess Leia, but I think overall Marvel should be pleased with how these titles are doing and the first issues in particular. The Star Wars title had the biggest fall, shedding over 9,000 copies, making Star Wars #9 the lowest selling issue for this title. Marvel has scaled back the number of variants for this title considerably the last few months, so I suspect we are starting to finally see the real sales level without variants goosing those numbers. Despite the slight drop, Star Wars remains the top selling ongoing series. The Darth Vader title, which has had fewer variants, climbed a modest 1,241 copies. Kanan: The Last Padawan is now titled Star Wars: Kanan and it shed less than 1,000 copies. With the Rebels television series due to kick off this month, it will be interesting to see if this title can grow it's sales in the next few months. With the new movie just 2 months away, Marvel solicited 12 reprints this month. I'm sure their plan is to have as much Star Wars product on the shelves for the month of December as possible. Here is a table with the number of Star Wars issues sold per month since January 2015 along with the average number of sales per issue. Note this chart does not include reprints. The average sale per issue would rank 4th on the top 300 chart for the month of September. Take a look at the Star Wars Sales Estimate Chart and please read the blog posting Shattered Empire #1, Saga Vol. 5 lead sluggish September comic orders. Star Wars: Shattered Empire #1 is the top selling comic book through Diamond Comic Distributors for the month of September 2015. The Star Wars title held onto 2nd place for the second month and Darth Vader slips one spot to 5th place. September was a weak month for comic sales overall as the industry is preparing for the Marvel relaunch. Head over to The Comics Chronicles to read more. Han Solo is perhaps the most beloved character in the original Star Wars trilogy. Han Solo's popularity hinges on him being the grey character in the original movie. Han is a smuggler and cynic, he is loyal to his companion and copilot Chewbacca, and his approach to the life is practical as opposed to idealistic like his younger friend Luke Skywalker. As the trilogy unfolds, Han wins the affections of Princess Leia and he evolves from the reluctant hero to a leader in the Rebel Alliance. Han is due to play a major role in The Force Awakens and one of the anthology movies will delve into his past. With so much interest in the character, it makes sense that Star Wars comic collectors are beginning to realize the importance of his first appearance in comics which pre-dates the original movie. Star Wars #2 has a cover date of August 1977 but was on sale in May 1977 just prior to the release of Star Wars. While Han Solo does have a cover appearance on Star Wars #1, it is the interior of Star Wars #2 that we are introduced to the character. Star War #2 has more going for it than just the first appearance of Han Solo. 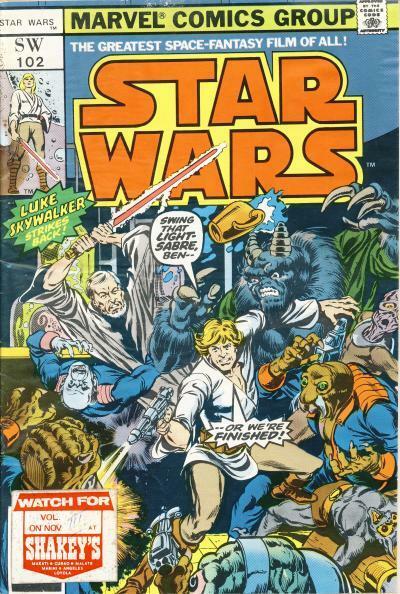 It is also the first appearance of Ben Kenobi and Chewbacca! Above are the different printings for Star Wars #2 minus Star Wars #2b, the expensive $0.35 newsstand version. Editorial Novaro was a publisher of comics for Mexico and other Spanish speaking countries until the mid 1980s. Editorial Navaro was based in Mexico City and they published translations of many U.S. comic books (these translations are now done by Panini Comics for the Mexican market.) They published a title called Clásicos del Cine or Film Classics which contains adaptations of 1960s and 1970s television shows and movies. 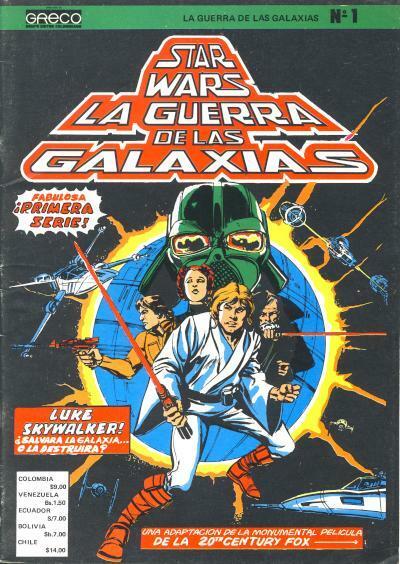 It is in this series that the Marvel Star Wars comic was translated for the Mexican readers. There are 4 main formats for comics in Mexico: revistas or magazines which are standard-sized comics, avestruz or ostrich which are slightly smaller than standard size comics, aguila or eagle which are medium or digest-sized comics, and colibri or hummingbird which are small sized comics. 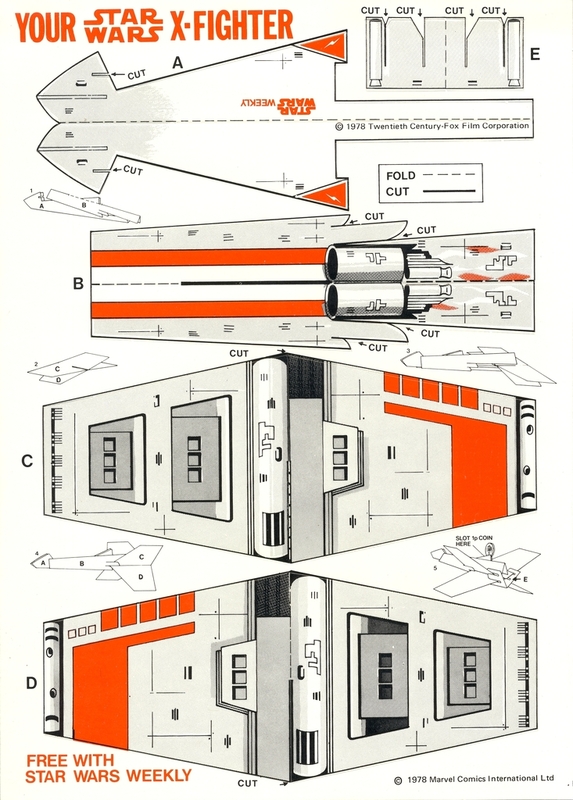 The Clásicos del Cine issues containing the Star Wars movie adaptation are in the aguila format, measuring 5 1/2" x 7 1/2". The movie adaptation was published twice a month in 4 issues, with each issue containing 1 and 1/2 of the U.S. issues. 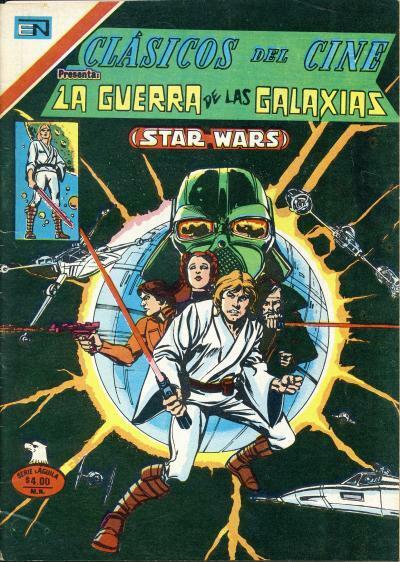 After the movie adaptation, Star Wars continued in the title with each issue of Clasico del Cine containing 2 U.S. issues and the title became monthly. The cover for the first issue is the familiar cover for Star Wars #1. Interestingly, the cover contains both the Spanish and English translation for the movie title. Kenner had shown an interest in expanding the Star Wars toy line beyond the movies with their original Ewoks and Droids toys based on the cartoons. Kenner also had plans to introduce a new story line and characters after Return of the Jedi and developed a new villain, Atha Prime, and his Clone Warriors in the mid 1980s. By this point, the Star Wars toy line was over 8 years old and Kenner knew they needed new characters to keep interest in the toys going. Ultimately, those plans were rejected by Lucasfilm and Kenner's Star Wars toy line ended. Hasbro (formerly Kenner) started the new Star Wars toy line in 1995. By 2006, the Hasbro Star Wars toy line had been going strong for over 10 years and it made sense that Hasbro would want to keep that line fresh with new ideas too. Unlike in the 1980s, Hasbro had the Expanded Universe, the books, comic books, and games that introduced new stories and characters to Star Wars, to choose from. Hasbro turned to characters introduced in the comic books for ideas for new action figures and released them in pairs along with a comic featuring those characters called Star Wars Comic Packs. The Star Wars Comic Packs were a welcome addition to the Star Wars toy line by long time Star Wars action figure collectors. It gave these collectors a chance to add action figures of characters that were part of the Expanded Universe during a time when Hasbro had already produced several versions of action figures for the movie characters. While these action figures sold well to older collectors, they did not sell as well to kids who did not necessarily have large collections of action figures based on the movie characters. In November 2010, online retailer Entertain Earth sold the final 4 Star Wars Comic Packs as exclusives. Star Wars Comic Pack #49 is packaged with Darth Nihl and Deliah Blue action figures. Star Wars Comic Pack #55 is packaged with Jarael and Rohlan Dyre action figures. Star Wars Comic Pack #59 is packaged with Jaster Mereel and Montross action figures. Star Wars Comic Pack #75 is packaged with Ysanne Isard and Baron Fel action figures. The 4 comics from these Entertainment Earth exclusive Star Wars Comic Packs usually fetch slightly more than the average Star Wars Comic Pack issue. It is reasonable to expect to pay $2 - 5 for one of these issues on eBay. After a few months where Marvel only went back to print on Lando #1, Marvel has decided to reprint 12 of their Star Wars issues in November. Marvel must have decided these reprints will not impact the orders for the trade paperbacks that are forthcoming for the Star Wars and Darth Vader titles. With The Force Awakens release only one month after these reprints are scheduled to ship, it does not hurt to have more Star Wars product available for potential readers. I wonder what color they are going to use for the 7th printing of Star Wars #1. They used green for the cover of the 6th printing which would be apropos for the 7th printing considering Marvel will most likely ship over 100,000 copies of reprints in the month of November. Gold would be appropriate too. There have been several blog postings on the Chinese lianhuanhua Star Wars comics, but there are other Star Wars comics in other formats that were published in China. The following comic is larger than a lianhuanhua but smaller than the standard comic format, measuring 7 1/4" x 6 1/2". 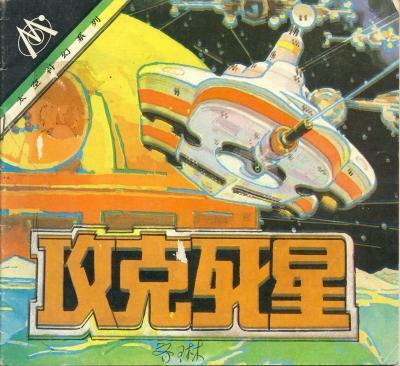 The front cover shows X-Wing and Y-Wing Fighters as they approach the Death Star with another ship in the foreground. The interior is in black and white. It is a fairly accurate adaptation of the Star Wars movie with some minor differences. One difference is the Millennium Falcon which looks more like the ship shown on the front cover than the one we are familiar with. Most of the characters looks like their movie counterparts, but some details are slightly different. Mos Eisley looks more like a futuristic city than the desert dwelling we see in the movie. Another difference is when Luke Skywalker is piloting the X-Wing Fighter in the battle against the Death Star the cockpit is larger. When the X-Wing takes damage we see R2-D2 inside the cockpit behind Luke putting out a fire similar to the scene in the movie when he puts out a fire on the Millennium Falcon. 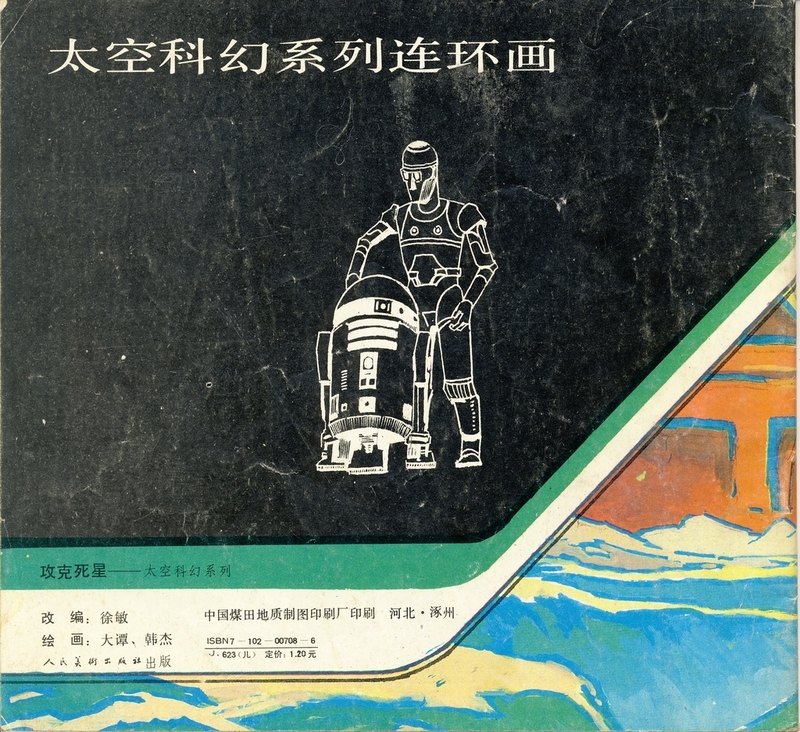 The back cover shows a picture of C-3PO and R2-D2 which is not representative of how they look in the interior nor is the drawing a representative of the art style inside. The art inside is more detailed, although it is not as elegant as some of the art in the Chinese lianhuanhua Star Wars adaptations. Even though this comic has an ISBN, I have been unable to find out more information about it. China adopted the 10-digit ISBN system in the late 1980s and changed to the 13-digit ISBN system in 2007, so this comic could have been published any time in that roughly 20 year period when they used 10-digit ISBNs. If you have more information about this comic, I would love to hear from you. The Korean Star Wars: Before the Force Awakens online comic by writer and artist Hong Jacga has received considerable attention since it began earlier this year in April and was announced as part of the new canon. That comic is now available for readers in English! Please take a look at the English Star Wars: Before the Force Awakens. As an aside, publishing our Marvel exclusives has been the single most successful endeavor for us during all of 2015. We had a very successful show in Salt Lake City last weekend, at least in part because we sold $4,000 in STAR WARS (2015) variant editions in just 3 days! Some of that revenue came from later printings variants, but the vast majority derived from fans purchasing our Mile High Comics STAR WARS and PRINCESS LEIA exclusives. In case you are wondering, the reason we sold so many of our variant editions is that more and more fans are catching on to the fact that we are seeking to continue publishing a Mile High Comics variant edition to each new edition of the primary monthly STAR WARS (2015) title, for as long as Marvel will allow. We are currently contracted through issue STAR WARS (2015) #12, and hope to be able to sign a contract soon for issues #13-#18. As far as we know, this is the first time in history that any comics retailer has published variants an entire comics series from Marvel. Making that commitment has already cost us more than $100,000.00 in upfront investments, but that risk has been more than justified by the incredible response we have been receiving from STAR WARS fans. Mile High Comics is planning on continuing to contract for exclusive editions for the Star Wars title for the foreseeable future. It makes sense because the exclusives are making money for them and the fans keep buying them. Mile High charges $19.95 for an exclusive issue until it is released and then increases the price to $24.95. For Star Wars comic fans who are buying these, this means they will be spending $240 a year (not counting the shipping costs) on these exclusives assuming the comic ships monthly and possibly more if Marvel decides to double ship for some of those months. Mile High is betting there are enough fans that are willing to spend that amount of money so they are willing to take the risk. When you consider most comic shop exclusives cost $10 - 15, Mile High is asking for a $5 - 10 premium over the typical asking price for an exclusive. In a past newsletter, they mentioned they were keeping the prices high to protect these exclusive comic's value for the buyer. How is that high price protection working though? Sales on eBay shows that there are bargains to be found for those willing to wait and take a chance on an auction that sells them in lots. 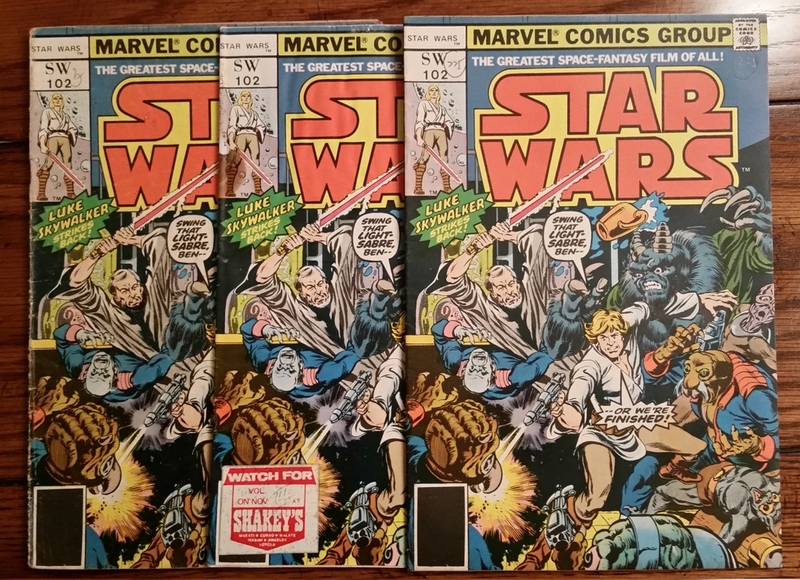 For example, a complete set of Star Wars #1 - 6 Mile High exclusives sold for around $68 in July. Compare that to Mile High's asking price of $120 for the set. Complete sets of Princess Leia #1 - 5 have sold for between $40 - 55 compared to $100 direct from Mile High Comics. But, those sales are not the norm. In fact, very few Mile High exclusives have sold on eBay with only 14 completed sales in the month of September. What this suggests is most people buying the Mile High Comics exclusives are collectors and I suspect very few sellers on eBay are willing to risk buying these comics for resale. What does all this mean for the value of these Mile High Comic exclusives long term? Most variants and exclusives have a tendency to drop in price over time. Mile High Comics is trying to mitigate that by starting with an initial higher price and increasing that price over time. Unfortunately, without publishing numbers, it is hard to guess at the trajectory for these comics, but if the 3,000 copies limit used for Star Wars #1 exclusives is true for these exclusives, I suspect most of these exclusives will not maintain their initial value. In effect, what Mile High Comics is doing is cutting out the middle man (the speculator) and selling these comics for a price where they are maximizing the dollars they see from these issues without leaving any meat on the bone for anyone else.